EClL requires the services of Ex-employees on fixed tenure basis for FLC/VVPAT activities of EMSD at various states for the ensuing General Elections-2019. The interested Ex-employees who are meeting the following criteria may submit their applications in the format provided below the advertisement. i) Consultancy can be terminated by giving one month notice on either side. ii) Preference will be given for those who have already deployed on Election Duty Et FlC activities while working in ECIL. iii) Medical Certificate from Chief Medical Officer of the Company or Govt. Medical Officer certifying fitness for undertaking the election related activity. iv) Persons who are meeting the above requirement and having aptitude to work may submit their applications which can be downloaded from our website. v) During the tenure of this engagement, they should not take up any assignments with other institutions. 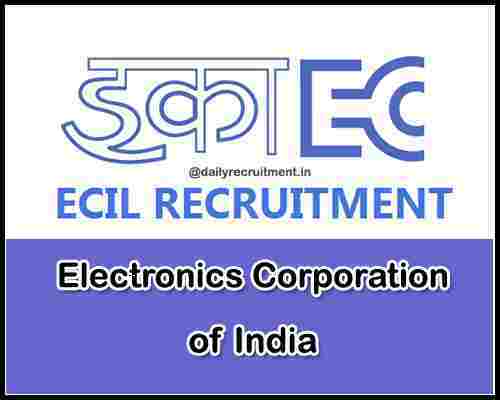 Education: Those who have completed their following qualification can apply for this ECIL Recruitment: “ Engineering Degree / Diploma / ITI” . Should have experience in Election Duty & FLC activity. Experience in man management including liaison with Govt. officials. Age Bond: Not Specified in the Advertisement. a) Screening of applications duly constituted Committee. c) Application [hard copy] along with copy of Service Certificate is to be sent to DGM, ClDC, Nalanda Complex, ECll, Hyderabad-500062. Candidates can apply to these Government jobs by paying ZERO application fee. Department is inviting all candidates to apply without any application fee charges. 12TH Dec. 2018 is the Opening Date to apply. 20th Dec. 2018 is the Last Date to apply.